With 'Breakfast in My Neighborhood' News10 viewers get a chance to decide where News10 Mornings anchor Dan Elliott will be broadcasting live from 5-7 a.m. on Friday, November 7. 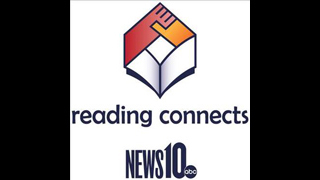 The voting starts Friday, October 31, and ends Tuesday, November 4 at 6 p.m.
With 'Breakfast in My Neighborhood', News10 viewers get a chance to decide where News10's Melissa Crowley will be broadcasting live from 5-7 a.m. this Friday, October 31. Voting began on-air Friday morning October 24 and ended Tuesday October 28 at 6 p.m. The winner was announced Wednesday October 29 on News10 Mornings. With 'Breakfast in My Neighborhood' News10 viewers get a chance to decide where News10 Mornings traffic reporter Melissa Crowley will be broadcasting live from 5-7 a.m. on Halloween, Friday, October 31. The voting starts Friday, September 24 and ends Tuesday, September 28 at 6 p.m.
Do you want to be News10's Halloween "Breakfast in My Neighborhood" winner? News10 is asking you -- Which breakfast restaurant in your neighborhood celebrates Halloween? Does the staff dress up in costume? And are there lots of Halloween decorations? If so, we want to know about it. Email us the name of that restaurant at writer@news10.net. We'll pick two restaurants out of those submittals, and then you'll get a chance to decide where News10 Mornings Anchor Dan Elliott will be broadcasting live from 5-7 a.m. on Halloween - Friday, October 31. With 'Breakfast in My Neighborhood' News10 viewers get a chance to decide where News10's Keba Arnold and Tim Daly will be broadcasting live from 5-7 a.m. this Friday, October 3. Voting began on-air Friday morning September 26 and ended Tuesday September 30 at 6 p.m. The winner was announced Wednesday October 1 on News10 Mornings. With 'Breakfast in My Neighborhood' News10 viewers get a chance to decide where News10 Mornings Anchor Keba Arnold and Reporter Tim Daly will be broadcasting live from 5-7 a.m. on Friday, October 3. The voting starts Friday, September 26 and ends Tuesday, September 30 at 6 p.m. The winner will be announced Wednesday, October 1 on News10 Mornings.